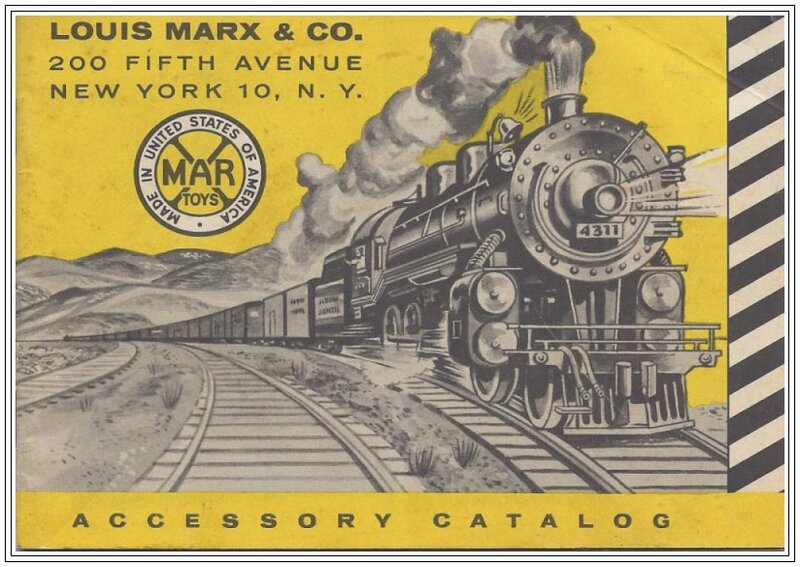 One of the bonus items in the "Marx Box" was a Louis Marx & Co. Accessory Catalog. I don't know the exact vintage of the catalog but several sources indicate that Marx introduced their first HO set for the Christmas of 1957. This catalog, on page 2, provides this important statement, "P.S. Watch for our precision engineered HO Guage Miniature Trains coming soon." This indicates that this catalog was printed prior to October 1957 when the Christmas toys for that year would be introduced. I suspect that this catalog would be about 1955 or 1956. I have scanned it and displayed it here as a reference for other collectors. I am assuming that this catalog is in the public domain as the Marx company is no longer in business. If you own the copyright to this publication and want it removed please send me e-mail with your request.